Wondering how to deal with grief? Bereavement is the loneliest feeling in the world. So many people say “I know how you feel” but they don’t, nobody can, grief is as individual as love. It makes you feel naked and vulnerable and at times you feel you hang on to your self control by the tips of your fingers. But you endure, every day you get up and keep breathing in and out and when a wave of pain rises up you ride it and make it through. So How Do You Deal With Grief? For 12 years I was a therapist working in social care, I rose to become Director of Care with a childcare organization and I still occasionally take on private clients for counseling. I have dealt with various aspects of grief in clients and the knock of effects from post traumatic stress to profound depression. I am also a former journalist, I own a medical tourism company and I lost my husband suddenly and traumatically 18 months ago. When I was going through the initial stages of grief, and struggling with how to deal with grief, I desperately felt the need for a monthly newsletter support system. Grief is intensely confusing and we pass through the stages of grief in our own time before the process is complete. Those people trying to comfort us, loved ones included, put time scales on it - “you will feel better after the funeral/holidays/first anniversary." Angel Wings newsletter is written to help you deal with grief. It shouts out is “It’s okay to grieve; there is love in the grief!” So go on, drop your barriers, stop being brave for five minutes, recognize the pain, allow it, because it is only by acknowledging the pain that we can make our way through it. Since my husband died I have moved countries, finished the house we were renovating, started a new company and made new friends. People say I am inspirational – I don’t feel it, I still feel like half the person I was - but I’m getting out there and I remember all the things I learned from him and whatever I achieve I achieve it because he influenced me. The lives we live are the long lasting memorial to the loved ones we have lost. Personally I find my motivation to keep going from many places - I get inspiration from poetry – The Winged Horse by Hillaire Belloc has always held great hope for me, I actually read it at my husband’s funeral. Even Robert Frost inspires me, with his long roads and promises to keep! I find comfort in other people’s experiences and stories as they resonate so profoundly. One I particularly recall was the widow of an actor telling how we lose our language when we lose a husband, the language we developed over years, the in-jokes and the shortcuts that intense communion naturally evolves. When we lose a partner we have to learn to communicate with the world again. It has been, and still is, an incredibly tough road to travel, but when I get down and guilty and lonely the thing that keeps me going is that I know we lived our dreams. We had so much damn fun in the time we had together and we saw the world and had adventures and those memories are worth everything. 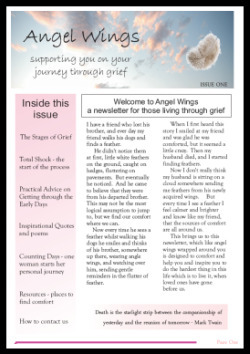 You are invited to download a complimentary issue of Angel Wings Newsletter; offering you support on your journey through grief. It will help you as you wonder how to deal with grief. Angel Wings, let's you know you are not alone. I have heard so many stories, as people I meet share their own individual accounts of grief. And normal, ordinary people endure such momentous events, experience horrible losses and trauma, and yet they survive. This newsletter is about all our stories. My hope is that you will find it helpful. And... you will consider sharing stories of what you are going through. It has been said that shared sorrow is half sorrow. I know from experience, that sharing helps.